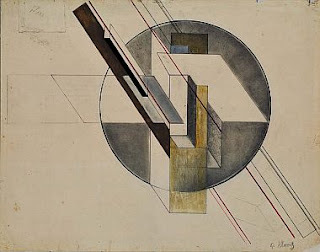 Gustav Klutsis... Konstruktsiia (Dinamicheskii gorod) (Construction [Dynamic City]) (1921, Pencil, colored ink, gouache and egg varnish on paper). From the exhibition Inventing Abstraction, 1910-1925 at MoMA. "...In 1912, in several European cities, a handful of artists—Vasily Kandinsky, Frantisek Kupka, Francis Picabia, and Robert Delaunay—presented the first abstract pictures to the public. Inventing Abstraction, 1910–1925 celebrates the centennial of this bold new type of artwork, tracing the development of abstraction as it moved through a network of modern artists, from Marsden Hartley and Marcel Duchamp to Piet Mondrian and Kazimir Malevich, sweeping across nations and across media. The exhibition brings together many of the most influential works in abstraction’s early history and covers a wide range of artistic production, including paintings, drawings, books, sculptures, films, photographs, sound poems, atonal music, and non-narrative dance, to draw a cross-media portrait of these watershed years."